The new Ford Focus was introduced last year and it seemed like a promising vehicle to challenge the best cars in the crossover segment. Shortly after, Ford announced that instead of the focus, the US would get the Focus Active. Yet again, plans have changed in response to Trump’s imposed tariffs and resulting higher cost of building small cars in the U.S.
U.S plans for the Focus Active are no longer. The automaker explains profits would not be enough to import the vehicle made in China and blames the Trump administration’s tariffs. In addition, the automaker was expecting to sell a small number of the vehicle each year in the United States has also contributed to the decision. The president of Ford North America notes in lieu of tariffs, costs would be substantially higher and resources could be better allocated. In a tweet Donald Trump suggested Ford begin building the vehicle in the United States, however, the automaker notes that this is easier said than done. Based on an expected sales volume of less than 50,000 units each year, it would not be profitable. A Ford spokesperson highlighted Ford’s manufacturing presence in the United States noting 80% of Ford vehicles sold in the U.S are built in the U.S proving that the decision made is based on cost. 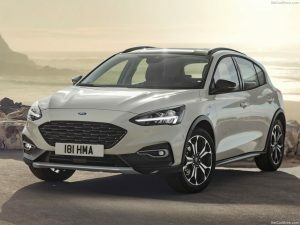 The Focus Active is the first vehicle to halt plans in the U.S following the tariffs but unlikely to be the last. There are many complexities to face with tariffs and their effect on global supply chains.